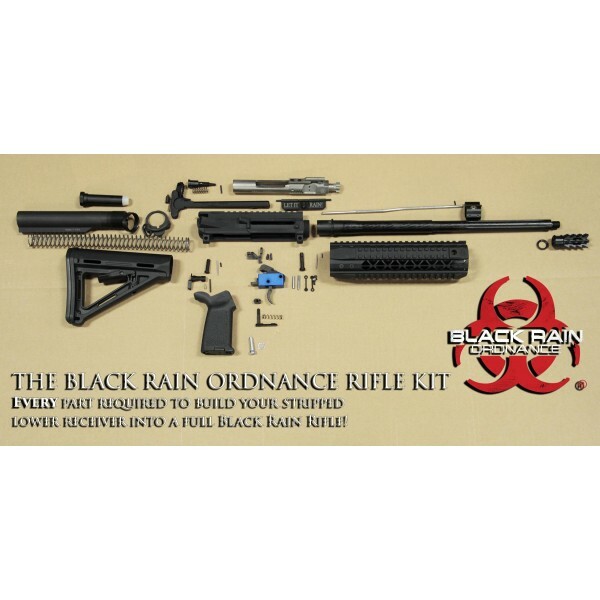 Black Rain Ordnance AR15 rifle kit. EVERYTHING to make your stripped receiver into a Black Rain 16" 223 Rifle (PG5 model). Black Rain Ordnance AR15 rifle kit. EVERYTHING to make your stripped receiver into a Black Rain 16" 223 Rifle (PG5 model) is in this rifle kit. This is NOT a firearm and does NOT have to be shipped to an FFL. Check local laws before purchasing. To add a Black Rain lower receiver order that separately (a 2nd order) unless you want everything shipped to your dealer. Lower can been seen by clicking the 'accessories' tab. If you'd like to switch some parts out we can do that as well. For example, if you would like a NorGuard receiver and/or NorGuard charging handle, different muzzle device, stock, rail, barrel, etc. Give us a call or an email and we can discuss.